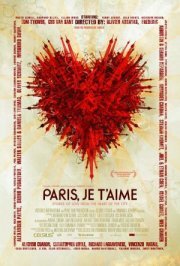 In Paris, je t'aime, celebrated directors from around the world come together to portray Paris in a way never before imagined — a portrait of the city is as diverse as its creators' backgrounds and nationalities. With each director telling the story of an unusual encounter in one of the city's neighborhoods, the vignettes go beyond the 'postcard' view of Paris to portray aspects of the city rarely seen on the big screen. In English, French, Spanish, Arabic and Mandarin, with subtitles where appropriate.